Introducing "EARS", the Earphone Audio Response System. miniDSP EARS brings headphone measurement capability to "the masses" - it's just an extremely affordable measurement rig for headphones and IEMs that we've built using the same technology as our popular UMIK-1 calibrated measurement microphone. Alternatively one could use EARS as a binaural microphone with USB audio streaming. Each pair of EARS has two microphone capsules mounted in a minimal "dummy head". Measurement output is via the driverless USB connection. The EARS are powered from the USB so there is no need for an external power supply. To measure headphones, just mount your headphones on the rig and run a measurement sweep using your headphone amp and favorite measurement program (e.g. Room EQ Wizard). The supplied calibration file corrects for the response of the microphone capsule and the ear. 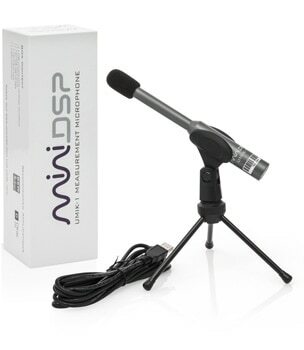 The miniDSP EARS is the perfect tool for creating EQ filters for the miniDSP HA-DSP headphone amplifier or for any other headphone system with EQ capability. NOTE: It's written on our user manual (but we do know that not everybody read them..;-) Please note that EARS is not an industry-standard measurement head. Even expensive (i.e. tens of thousands of dollars) test jigs can produce measurements that are different to each other depending on the type of ear simulator. Our goal with the EARS is to produce something that is affordable and fun to use. All EARS are calibrated with unique left and right calibration files. One of the compensation types will also need to be chosen (see the User Manual for details). To download the calibration files, look for the 7 digit serial number found on the EARS unit. Enter the serial number in the form below (three digits then four digits e.g. 860-1001). Your calibration files will automatically download in most browsers. If not, click on the links provided to manually download. In this app note, we will walk through EQ-ing your headphone based on measurements taken with the miniDSP EARS measurement rig. To implement the EQ, the app note will assume that you have a miniDSP HA-DSP headphone amplifier or another miniDSP device such as the 2x4 HD. However, the technique can be used with many other devices and also with software implementations, as long as they have a full parametric EQ capability. For devices that don't have a full parametric EQ or that can't have an REW measurement signal run through them, see the related app note Headphone EQ for iPhone (or Android, or DAP). There are a lot of factors that affect a headphone's sound, but the frequency response is the primary one. It determines not just the overall balance of bass, midrange and treble, but also the distribution of harmonics that are part of every musical note. Headphones (and IEMs) are complicated things when it comes to their acoustics. Unlike a speaker, which can be measured for accuracy in an anechoic chamber, headphones can only be measured when they are on a "head" (either real or artificial). Sound bounces around in the tiny confined space between the headphones and your ears, and travels down the ear canal until it eventually reaches the eardrum. Professional artificial measurement "heads" attempt to simulate this environment, and as result are very expensive. Despite their cost, they still produce very different results, as shown in the graphs in this article by Audeze. Furthermore, we all have different anatomy: studies show the acoustic signal at the eardrum varying by 5 dB in the bass, for example. Factors such as the positioning of the headphone, the seal of the pad to the head, and so on, will change the measurements. Finally, different people have different subjective preferences. So, when you run headphone measurements for EQ, it's important to treat the measurements as a guide. You always need to listen to the result of any EQ based on the measurements, and adjust it so that it sounds right to you. Because there are a lot of factors affecting the sound of a headphone, you probably won't be able to EQ a headphone you don't like into one that you do. It's best to start with something that basically sounds good to you. The headphone designer(s) will have traded off all of those factors when designing the headphone. So correcting only the frequency response may not produce the expected result. Again, you need to listen for yourself and decide how to apply the EQ. In this app note, we suggest using just a few bands of EQ, say no more than 5. This will make it easier to make manual adjustments when auditioning. Don't try and flatten every little bump and "wrinkle" in the measured response. Just work to make the response closer to flat. Regardless of what the measurements say, work within the natural capabilities of the headphone. A bass-light headphone may not respond well to a lot of boost in the bass, for example. The EARS page on the miniDSP website now has a compensation type named "HEQ", for "Headphone EQ". Go there now, enter your serial number and select HEQ to download the calibration files. These calibration files help simplify the process of EQing headphones. Use the All SPL tab in REW to create an average of the left and right measurements. Optionally, you can take several measurements on each side with the headphone moved a bit each time, and average all of them. The intent of the HEQ compensation is that, when it is used to measure a "neutral sounding" headphone, the resulting measurement will be approximately flat. It is similar in intent to the "preferred headphone target response" identified by Olive, Welti and McMullin (Ref. 1) but adapted for the EARS. Let's look at a couple of examples. Headphone A is a good quality headphone that is generally considered to be "dark". Subjectively, we felt that it was withdrawn on vocals but also a little hot in the high treble. Bass is solid but it doesn't have a lot of sub-bass. Its response when measured with HEQ is shown in Figure 1 in red. You can see that it measures low (compared to the flat line) in the 2 to 7 kHz area, which explains the "darkness." Headphone B is also a good quality headphone but a very different type of design. Reviews refer to this headphone as "crystal clear". Subjectively, we felt that it is indeed very clear (great for acoustic music) but that the whole treble region was lifted too high. Bass was good, but sounded like there is a broad bass hump with the sub-bass and midrange on either side of it missing. Its response when measured with HEQ is shown in Figure 1 in mauve, which shows the elevated treble and the bass hump. To calculate the EQ, view the averaged measurement (of left and right, optionally with additional measurements). Click on the EQ button to open the EQ screen. Set Equaliser to MiniDSP 2x4 HD. This will work for the miniDSP HA-DSP. The parametric EQ settings will also work for many devices that have parametric EQ. Set your target curve flat using the Target Settings values shown below. For the Target Level, start with 84 dB if you have followed the measurement procedure in the user manual. Or, click "Set target level" to have REW calculate it. You may need to experiment with this setting, as different target levels can result in simpler EQ curves. Set the correction range that you want. To start with, try 20 Hz to 20 kHz. You may want to change this later. Click on "Match response to target" to have REW calculate a set of correction filters. That's your starting point. Now adjust the filters manually. The basic process is to change a filter from Auto to Manual, change its parameters (Type, Frequency, Gain, Q), then click on "Match response to target" to get REW to recalculate the other filters. Then repeat. Don't worry if there are some "peaks and valleys" left (with many headphones, it's unavoidable anyway). Also, don't try too hard to fill in the valleys. Once you have a set of filters, copy the EQ settings over to your HA-DSP or other device. If copying a shelving filter (type LS or HS), set Q to 0.7. Important: you will also need to reduce the input gain by the maximum amount of boost you have used in your EQ, to avoid clipping. For example, if you have a maximum boost of 6dB in your EQ, set the input gain to -6 dB. Since the maximum gain in the EQ is 6 dB, we set the input gain to -6 dB, to avoid any possibility of clipping. You will notice that we have a low-shelving filter here that boosts the low end response by 3 dB. 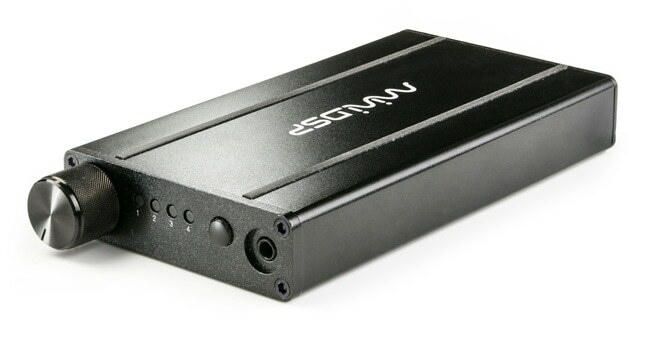 This mild bass boost is built into the HEQ curve, so a headphone that normally measures with a flat bass response will tend to "droop" with the HEQ compensation. If you prefer to not have this type of boost, simply leave out this filter or adjust your EQ to droop a little in the bass. That's it for this app note! Have fun, and please let us know of your headphone EQ results in our forum. "Listener Preferences for In-Room Loudspeaker and Headphone Target Responses," Sean E. Olive, Todd Welti, and Elisabeth McMullin. AES Convention Paper 8994, October 2013. Figure 17.